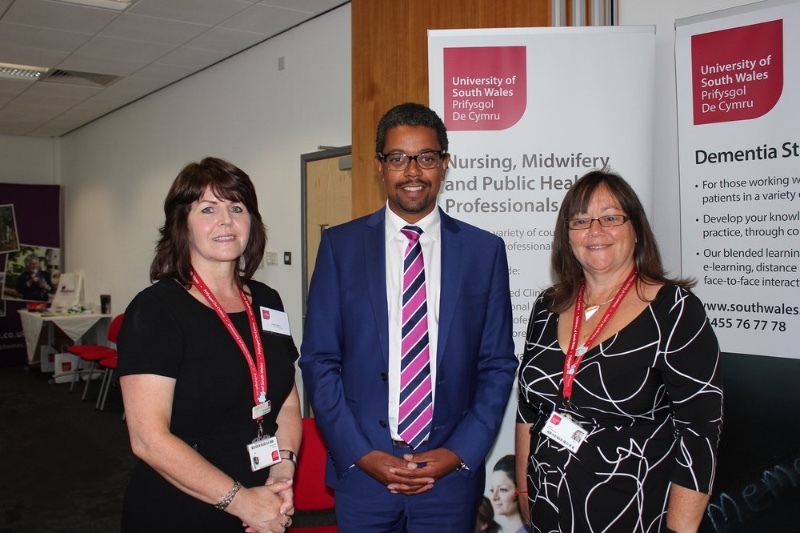 The Cabinet secretary for health, wellbeing and sport, Vaughan Gething, set out Wales’ Dementia Action Plan at an event at the University of South Wales last week on September 14. The university hosted the #USWDEM16 Conference where the theme was ‘Service Innovation and Best Practice’. As well as the cabinet secretary there were also talks by Sarah Rochira, the Older People’s Commissioner for Wales, Judith Major, Keep Safe Cymru (South Wales Police), Mark Jones, of the Young Onset Dementia Service, Cardiff and the Vale UHB, and representatives of the Welsh DEEP (Dementia Engagement and Empowerment Project) Network. There was a presentation by Karen Kitch entitled Living With Dementia… My Story, the story of award-winning Private Eye cartoonist Tony Husband’s dad’s dementia, entitled Take Care Son: The Story Of My Dad And His Dementia, and by carer Viv Morgan, entitled What’s Best For Alan? A Wife’s Story. Health secretary Vaughan Gething (pictured below with conference founder Karyn Davies, left, and Nicky Genders, head of the school of care sciences) said: “We are committed to making Wales a dementia-friendly nation, which requires effort and commitment from everyone – clinicians, educators, carers and people living in our communities. Vaughan Gething, the cabinet sectary for health, well-being and sport, said: “The Dementia Strategic Action Plan will help to ensure that Wales is at the forefront of dementia care – and particularly earlier diagnosis – by raising awareness of the positive steps we can all take to reduce our chances of developing dementia.